or have problems with malicious svchost.exe running in processes? Here you will find complete description and solution for "Generic Host Process for Win32 Services encountered a problem" error. If True Sword shows that you do not have svchost.exe virus, then use our Svchost Fix Wizard to solve generic host win32 services problem and all other similar errors of svchost.exe service. What is an Generic Host Process for Win32 Services and svchost.exe? Generic Host Process for Win32 Services or svchost.exe is a legal and essential component of Windows which is used to host services which run from dynamic-link libraries (DLLs). Multiple instances of Svchost.exe can run at the same time. So it is not a problem in most cases if you see five or six or even more copies of svchost.exe running in your services because they host different groups of DLLs. However, there are several known spyware and trojans that pretend to be legal svchost.exe. They usually have the same name or one of the following names: svchost.exe, svchosts.exe (which often causes svchosts.exe page faults), Generic.exe, svcchost.exe and several others. Please note that legal svchost.exe should reside in Windows\System32 folder and should not appear in startup list. 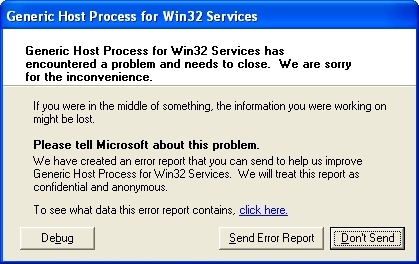 Why do you see "Generic Host Process for Win32 Services has encountered a problem" or similar error messages? The are several possible reasons of this error message. Reason 1: You have one of numerous worms, viruses and trojans which pretent themselves to be legal svchost.exe or use legal svchost.exe to run themselves at windows startup. These threats include: CashToolbar Downloader-MY, System1060, CoolWebSearch Svchost32, ADCLICK-AG, ADCLICK-AX, ADUYO-A, AGENT-V, AGOBOT-KL, AUTOTROJ-C and many others. Reason 2: Some legal DLL which uses svchost.exe to run itself at Windows startup crashed and causec crash of the whole svchost.exe service. Reason 3: You have just installed update from Microsoft which contains errorneous verison of Windows Installer or double-byte character set (DBCS) characters support (only occures in Microsoft Windows XP Service Pack 2 (SP2)). Use our award winning program - True Sword - to remove svchosts.exe, svchost.exe, Generic.exe and svcchost.exe virus infection. True Sword will find and eliminate this problem and more than 1 415 713 other dangerous threats including trojans, spyware, adware, riskware, problemware, keyloggers, dialers and other kinds of malicious programs in several seconds. Fast, easy, and handy, True Sword protects your computer against malicious programs that do harm to your computer and break your privacy. True Sword scans your hard disks and registry and destroys any manifestation of such malicious programs. Standard anti-virus software can do nothing against privacy breakers and malicious programs like that. Get rid of trojans, spyware, adware, trackware, dialers and keyloggers in one click now! 1) Purchase True Sword if you have not yet done this. Please note that along with complete win32 generic error solution you receive one of the most powerful anti spyware and anti trojan scanners in the world which finds and solves more than 1 415 713 other dangerous threats including trojans, spyware, adware, riskware, problemware, keyloggers, dialers and other kinds of malicious programs in several seconds. 2) Send your order number to our support team and ask for Svchost Fix Wizard. We will immediately send you Svchost Fix Wizard and assist in solving all your svchost.exe-related problems. If our Svchost Fix Wizard does not solve your problem, we will give you 100% refund. 1) Scan your PC for the following viruses: CashToolbar Downloader-MY, System1060, CoolWebSearch Svchost32, ADCLICK-AG, ADCLICK-AX, ADUYO-A, AGENT-V, AGOBOT-KL, AUTOTROJ-C.
2) Go to Windows Automatic Updates properties (right-click on My Computer, then click on Properties and switch to Automatic Updates tab). 3) Choose "Turn Off Automatic Updates", click OK and reboot your PC. 4) Manually update Windows using "Windows Update" shortcut in the start menu. 5) Turn automatic updates on. 6) If your problem is not solved on this step, uninstall old Hewlett-Packard printer and scanner drivers (if any) and download new drivers from the manufactures web site. If you are not sure which solution to choose or want us to assist you in solving your problem with "Generic Host Process for Win32 Services has encountered a problem and needs to close. We are sorry for the inconvenience" and similar error messages feel free to write our support team: open a new support ticket with the subject "svchost.exe problem". We will get back with solution of your problem in 24 hours or less.